While Russia's currency and capital markets are tumbling in a delayed response to Friday's US sanctions against a handful of Kremlin-friendly billionaires, one vital metal used across the globe in aircraft manufacturing and the auto industries is soaring today as a consequence to sanctions against Russia. Aluminum prices have soared, first on Friday and then again on Monday, amid growing fears that sanctions on a Russian metal producer will prevent it from supplying the global commodity market, and could threaten a significant part of the global supply chain. On Friday, the Treasury sanctioned Russian individuals, officials, state-owned firms and companies, including Rusal, the world's second largest producer of aluminum, under provisions of a law Congress passed last year to retaliate against Moscow for meddling in the 2016 U.S. presidential election. The action actions target Russian oligarchs whose companies have wide-ranging involvement in international capital markets. 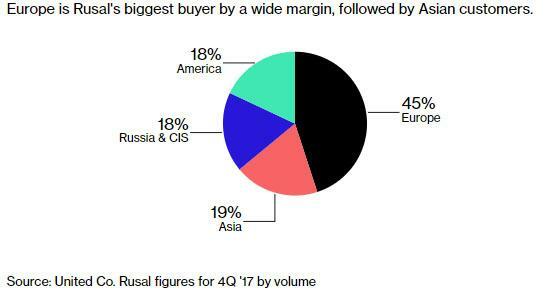 Of these, Rusal may be the most important one as it accounts for about 17% of supply outside of China, according to Harbor Intelligence, whose managing director, Jorge Vazquez said that sanctions are "going to create chaos in the short term." 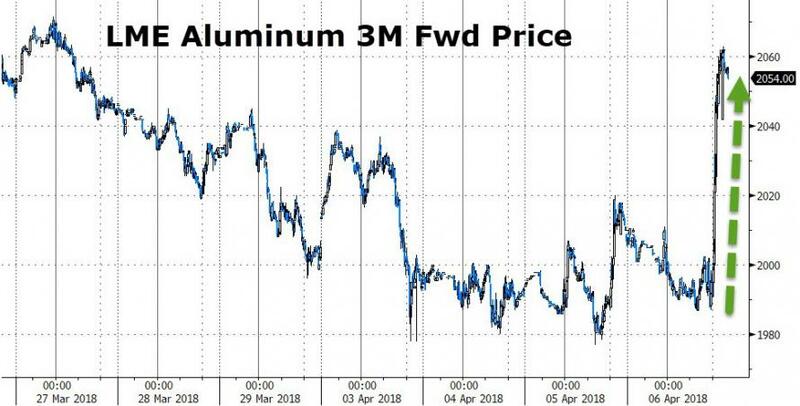 “This does warrant a little bit of panic buying by traders - the risk is large enough and real enough to buy on the back of insecurity of supply,” said Daniel Hynes, senior commodities strategist at Australia & New Zealand Banking Group Ltd.
And panic buying there is: aluminum for delivery in three months soared as much as 4% to $2,124 a metric ton on the London Metal Exchange, extending a 1.6% gain in the previous session, heading for the biggest jump in more than 2 years. At the same time, the stock of Rusal tumbled a whopping 50% today alone amid fears that US sanctions - which have been designed to make it impossible for Deripaska's commodity giant to do business in U.S. dollars - would terminally cripple the company, forcing an imminent bankruptcy and collapse for the company that is owned by one of President Vladimir Putin’s closest allies. 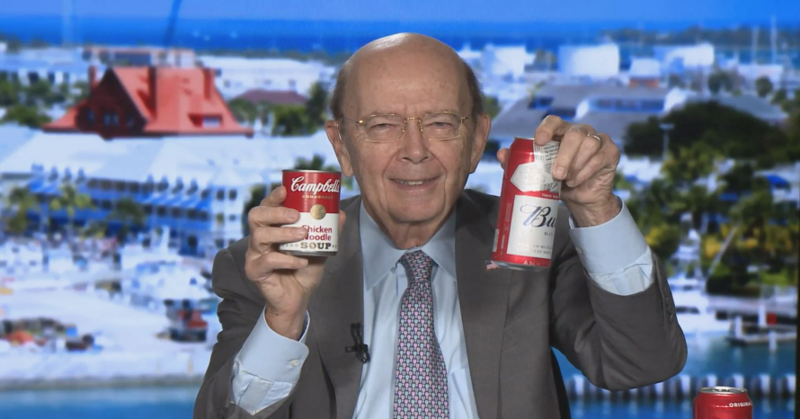 Completing the trifecta of pain, Bloomberg notes that - as expected - international trading houses have stopped buying aluminum from Rusal which is suddenly "toxic" as a result of the US sanctions, sending shock waves through the market for the metal used in everything from airplanes to beer cans. Trading houses have been advised by their banks and lawyers that they can’t continue trading with the Russian company, according to executives at five companies that regularly buy from Rusal, who spoke under condition of anonymity due to the sensitivity of the discussions. Rusal, the biggest aluminum supplier outside China, has also asked them to "immediately withhold all payments" to the company, according a copy of a letter sent by its head of marketing. John Whittaker, a partner at law firm Clyde & Co LLP who advises commodity traders, compared the restrictions on Rusal with the U.S. sanctions against Iran that restricted oil exports from the country and helped lift global prices. "It would be an inhibiting factor for international traders," Whittaker said. "I can’t think of anything as significant since the banking sanctions in 2013 against Iran." Meanwhile, the Russian Foreign Ministry said it was working on a response: “We have a whole list of possible measures that are being studied." 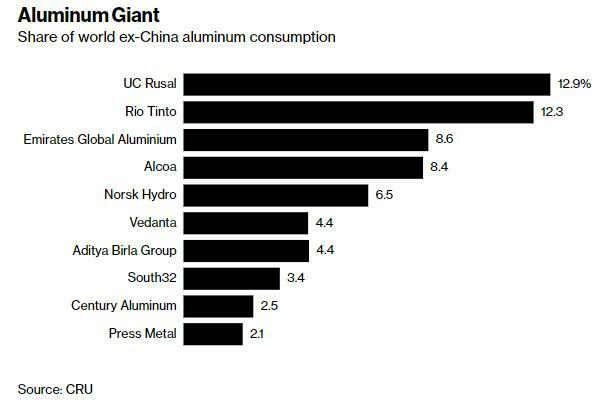 Until then, however, questions have risen how Europe will procure its much needed aluminum used in virtually all high-tech industries, now that Rusal's products are "toxic" for all US allies : note that Europe is Rusal's biggest buyer by a wide margin, followed by Asian customers. US sanctions could lead to other, unexpected downstream effects. As Bloomberg points out, the move also raises questions for Glencore and its billionaire chief Ivan Glasenberg: the commodity giant is one of Rusal’s top shareholders, owning an 8.75% stake and is also the the biggest buyer of its metal, having bought $2.4 billion of metal from it last year. Ivan Glasenberg sits on the Rusal board. And now we wait to find out whether other producers can step in to fill the void left by Rusal, and if not, how big the inflationary impact of the sudden aluminum supply chain shortage will be. 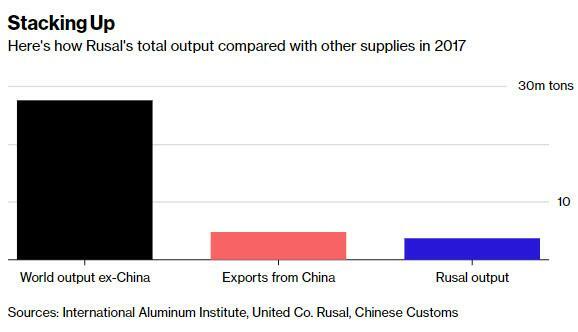 One thing is certain: the potential collapse of Rusal will have a far greater impact on final costs - and inflation - than the US tariffs on steel and aluminum imports.